In the Report Options, Log Settings and Extended Results views you can see several patterns for names of subfolders and names of HTML reports and WPR/CSV files with test results. You can modify these patterns: click the Edit pattern... button next to the pattern and you will see the following dialog. The pattern is shown in the Pattern edit box. 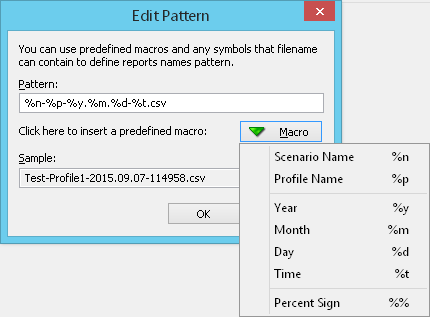 Click the Macro button to select the predefined macros. You can use any symbols that a file/folder name can contain to define patterns for names of files and subfolders. You can also specify a subfolder of the default folder for saving the HTML reports and WPR/CSV files with test results. Generated name is shown in the Sample field.